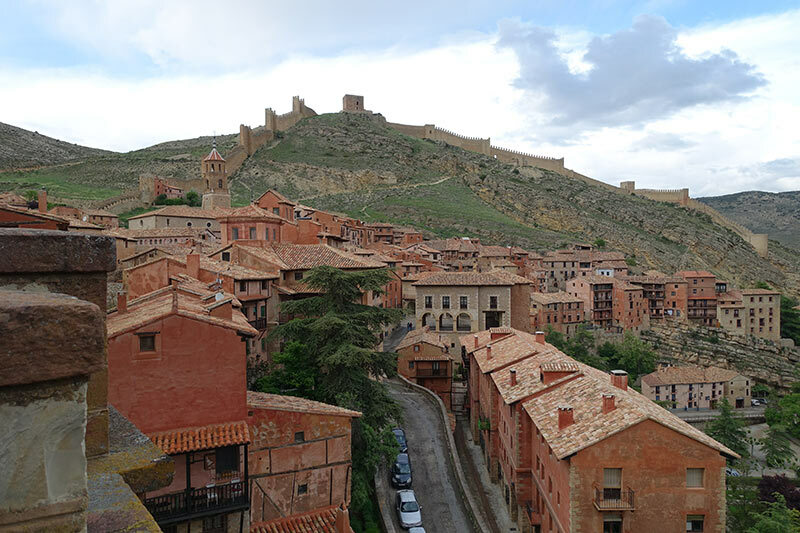 We drive through some of the most amazing scenery to Visit Albarracin, in southern Aragon, and officially one of the 68 prettiest towns in Spain. 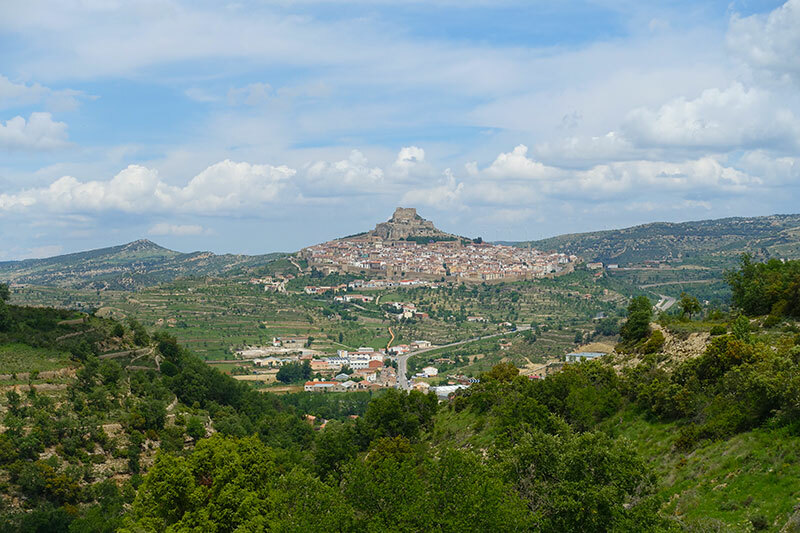 We had just visited another of the official prettiest towns in Spain, the stunning Morella and can attest that yes it was beautiful. 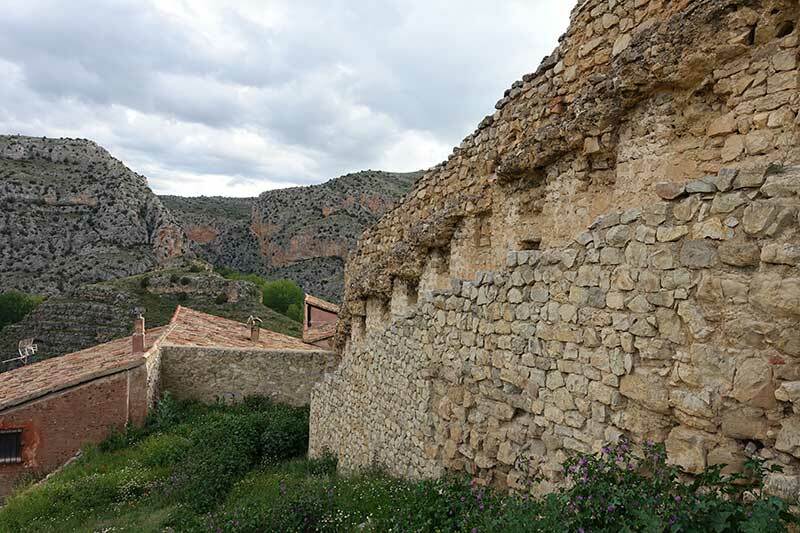 Read about visiting Morella,Spain here. We crossed the flat plain from the city of Teruel and then headed through craggy limestone mountains, where we saw caves, and understood why people come to rock climb here. There are a large number of cave paintings on the walls of the Abrigo de los Toricos del Prado del Navazo, Abrigo del Medio Caballo and Abrigo de Doña Clotilde. 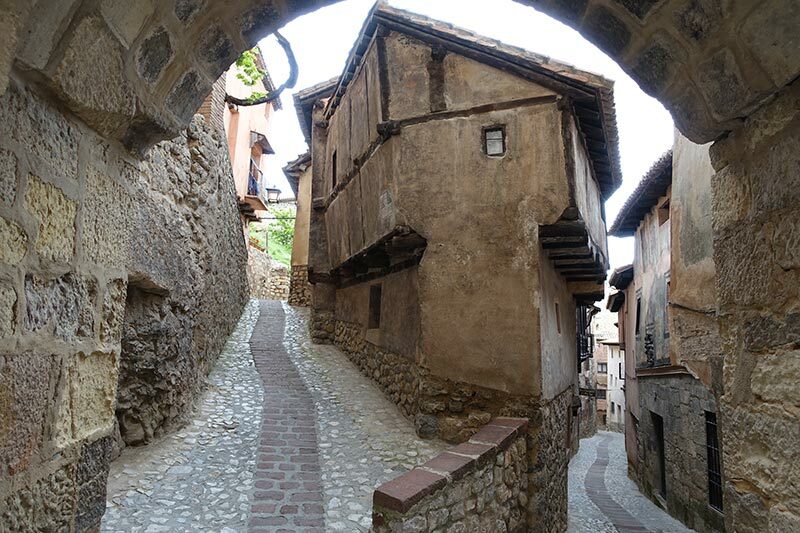 The road weaves and winds as we approach another of the prettiest towns in Spain – the medieval village of Albarracin. We see it in front of us rising up dramatically on a near vertical cliff face. It is breathtaking. 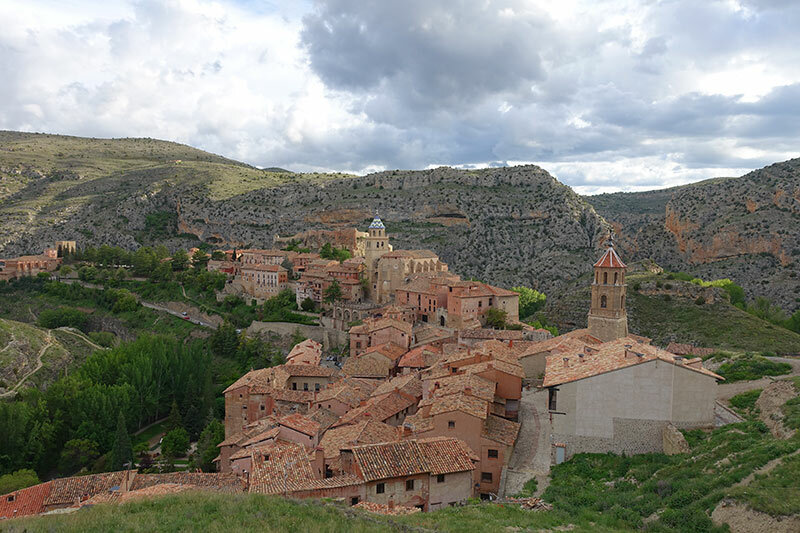 Albarracín, with its fortifications, churches and houses sits precariously on the high outcrop, some 3,878 feet above sea level, surrounded by the (river) Río Guadalaviar, in the Sierra de Albarracín. 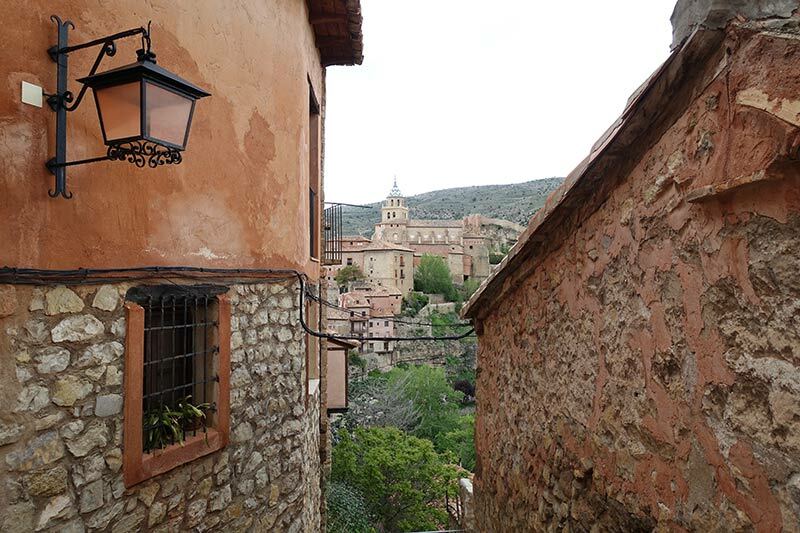 The medieval town of Albarracín was declared a National Monument in 1961, and there is talk of it being granted UNESCO status such is its uniqueness and beauty. 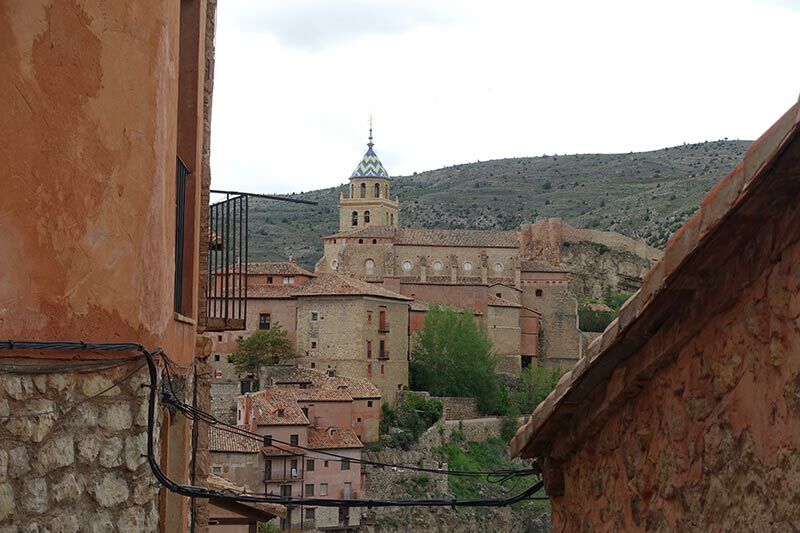 Albarracin is known for its archaological sites and Moorish influenced architecture. 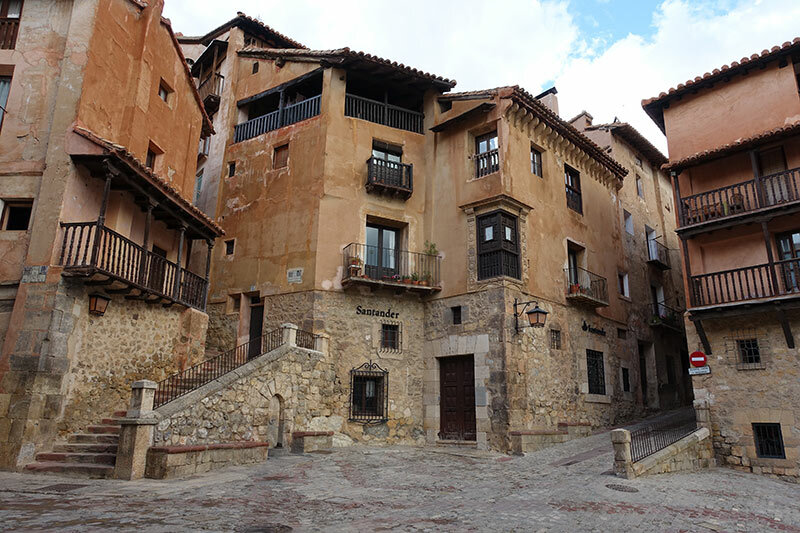 Albarracín is a maze of narrow cobble stone streets, buildings tumbling into each other, charming churches and huge castle walls, the Murallas de Albarracin or Walls of Albarracin, which are not dissimilar to the Great Wall of China. With a population of just 1,054 (2016), this really is a quaint village, and the architecture will blow you away. Albarracín is pink. The buildings are pink due to the colour of the local stones and materials (gypsum) of which they were constructed, and the authentic old houses take you back to the medieval ages. 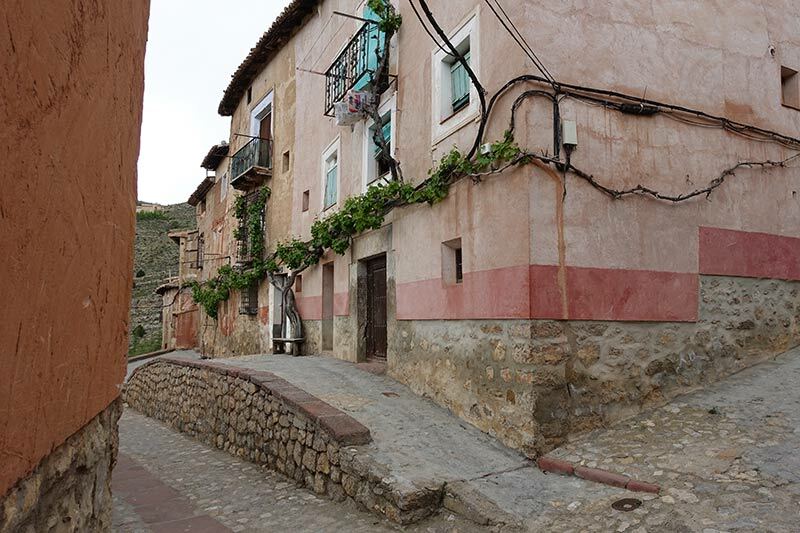 Get a map and look for the houses of Casa del Chorro, Casa de la Julianeta and Casa de la Calle Azagra which are excellent examples of the old houses in the town, and are well preserved. Also make sure to explore the Bishops palace, the Dolz del Espejo. 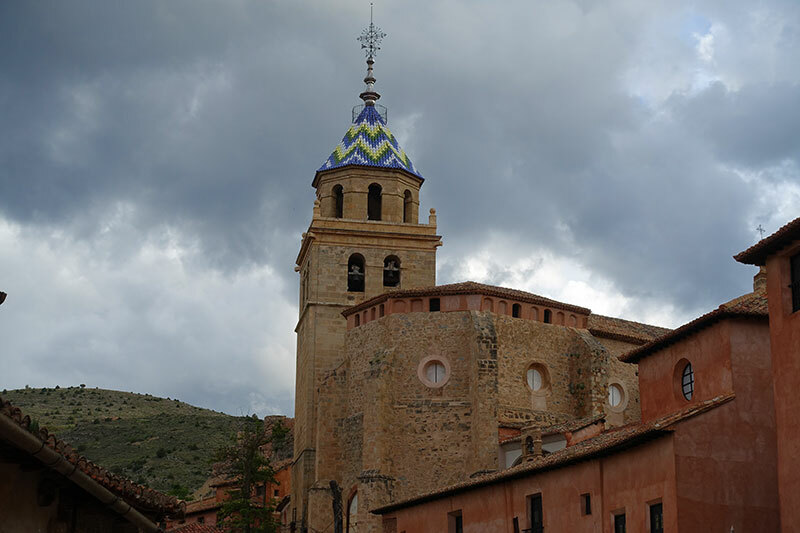 The Catedral de Albarracín is a Roman Catholic church in the town of Albarracín. The belltower is topped with a lantern cupola The treasury can be seen in the capitulary room and includes some silverwork and 16th century tapestries. Seven of them were sewn in Brussels and tell the story of Gédéon. The Plaza Mayor is the central square and the heart of the town. 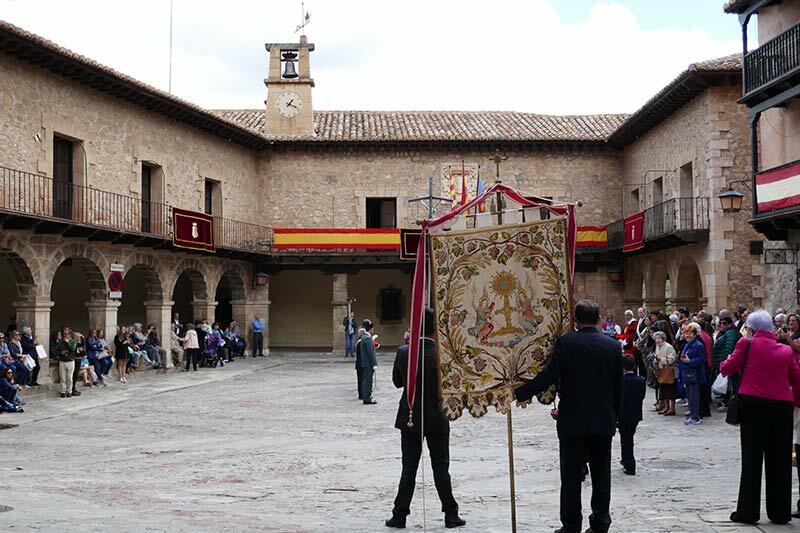 There is a map outside of the town hall in Plaza Mayor showing you where each of these are, and also a small tourism office at Calle San Antonio 2. 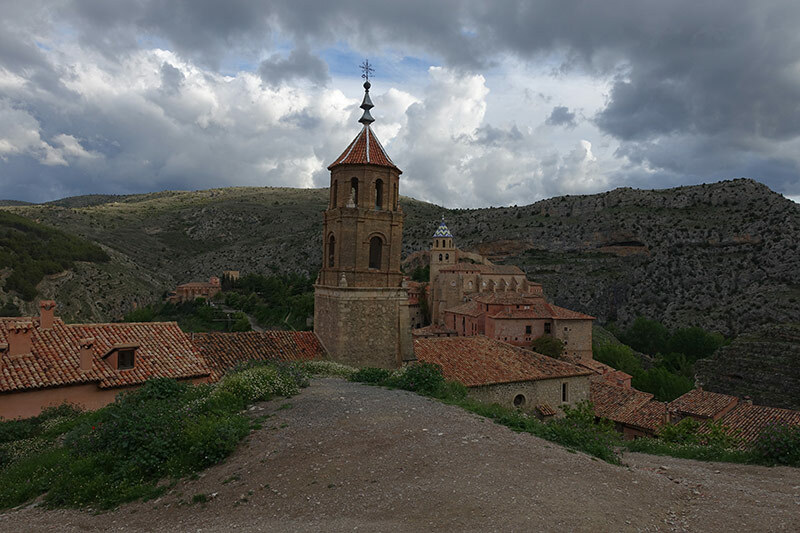 You could also choose to do a guided walk through the Fundación Santa María de Albarracín which is highly recommended to know more about this intriguing and pretty village in Spain. A hike with some of the most spectacular views over the village of Albarracin can be seen from the Walls of Albarracin. 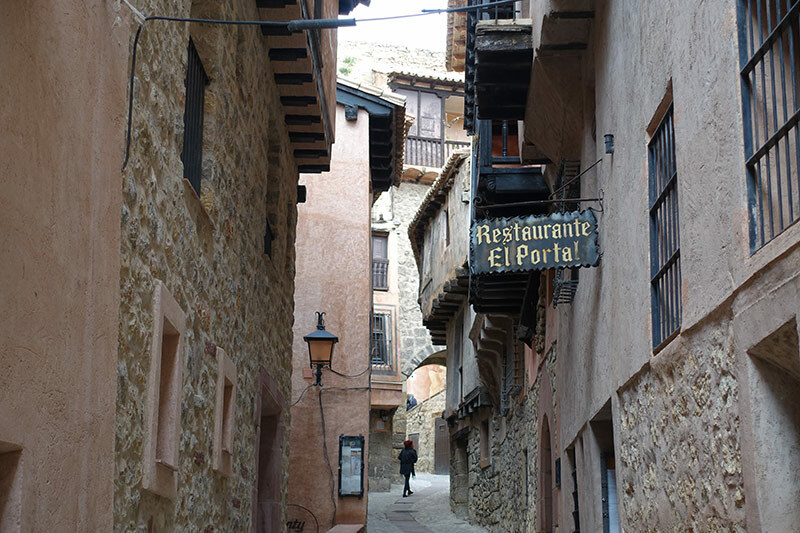 This portal is one of the most photographed in Albarracin. 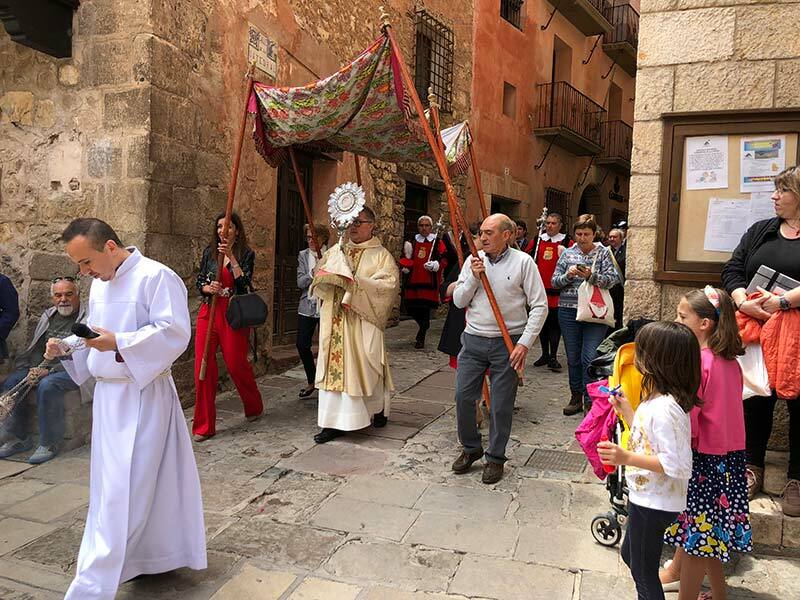 When we arrive,d there was a mass and a religious festival occurring for the Corpus Christi feast. 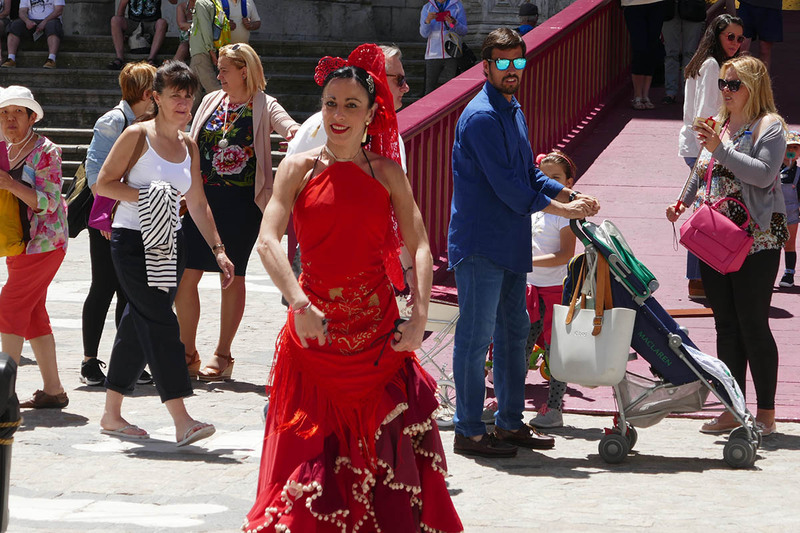 Locals sat around Plaza Mayor drinking beer and eating, which seemsed a little odd as the priest was running a mass being as this is and was a solemn festival, but it all worked. Children running around throwing flower petals, as the priest blesses the town and the local dignitaries pay their respects at the altar. 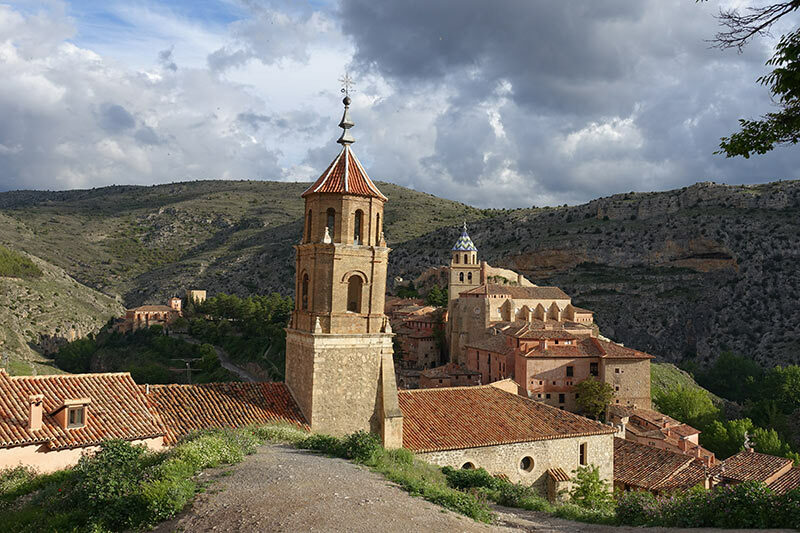 Albarracin was of strategic importance in Spanish history as it bordered the three former kingdoms of Castilla, Aragon and Valencia. 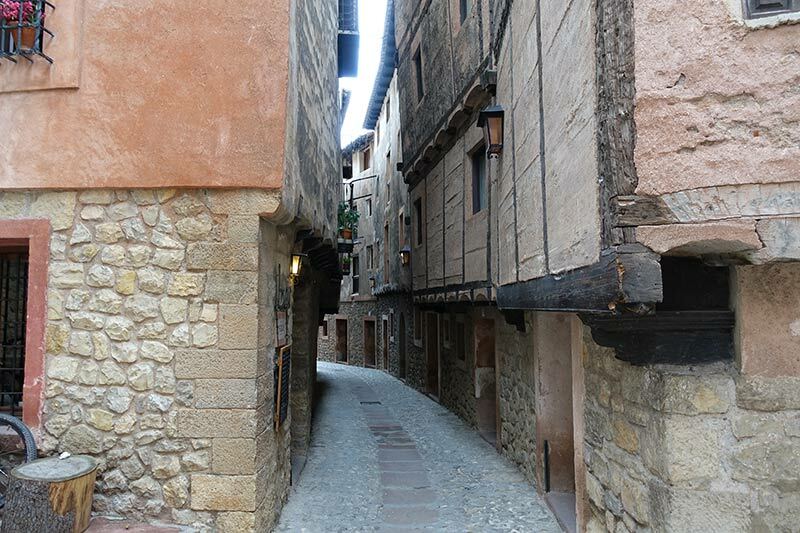 Albarracín has a unique medieval history. It was first a Berber kingdom, under the reign of the al-Banu Razin family and the capital of an 11th-century Islamic state, before being annexed to the Kingdom of Aragon. It later became a Christian kingdom and all of these elements and its historical past can be seen in the village and the architecture. Source. 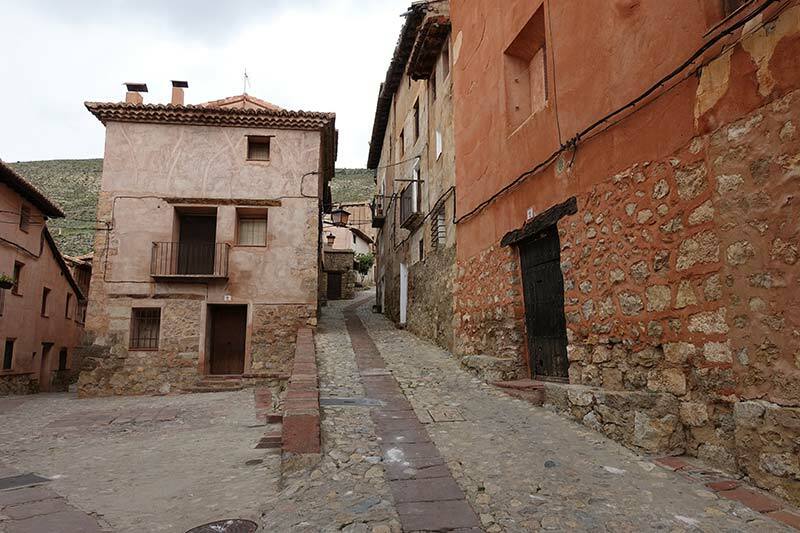 You must be able to climb steep hills in order to visit Albarracín, but it is worth it. Or you could sit in Plaza Mayor and have a beer with the locals and admire the pink crooked houses, and the magnificent surroundings. 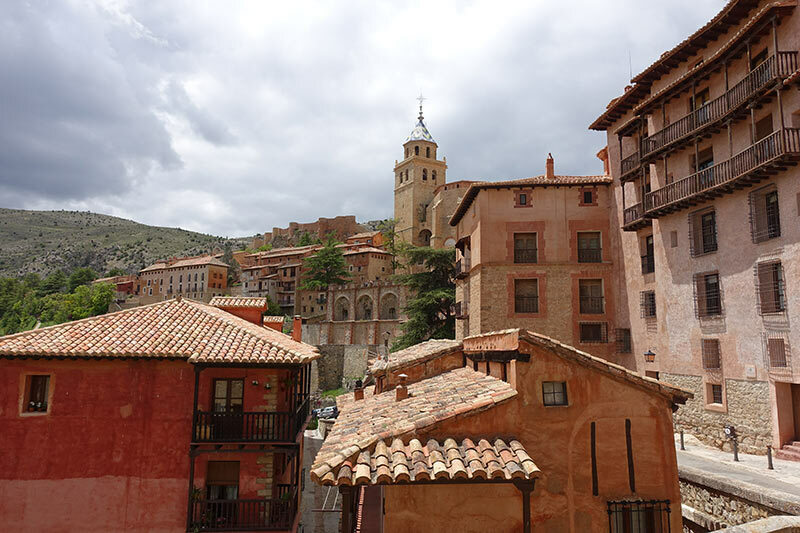 Albarracin is 30 minutes from Teruel and two hours from Valencia, Spain, and located in Aragon, an autonomous community in Spain. You can take a bus from Tereul, though arriving by car is much easier. We stayed in Hotel Arabia for one night, which is ample time to see the village. 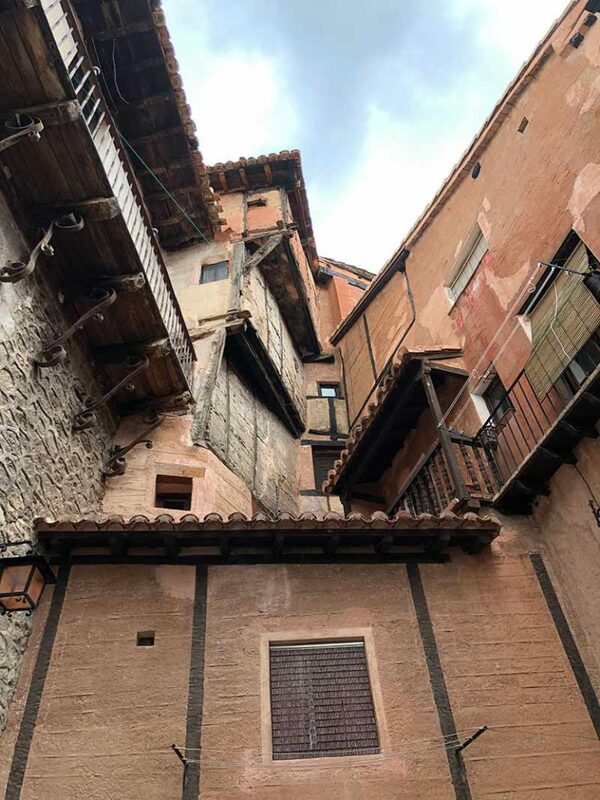 It was an old convent, and is located in the heart of Albarracín Old Town. The hotel has been done up to fit the modern traveller. 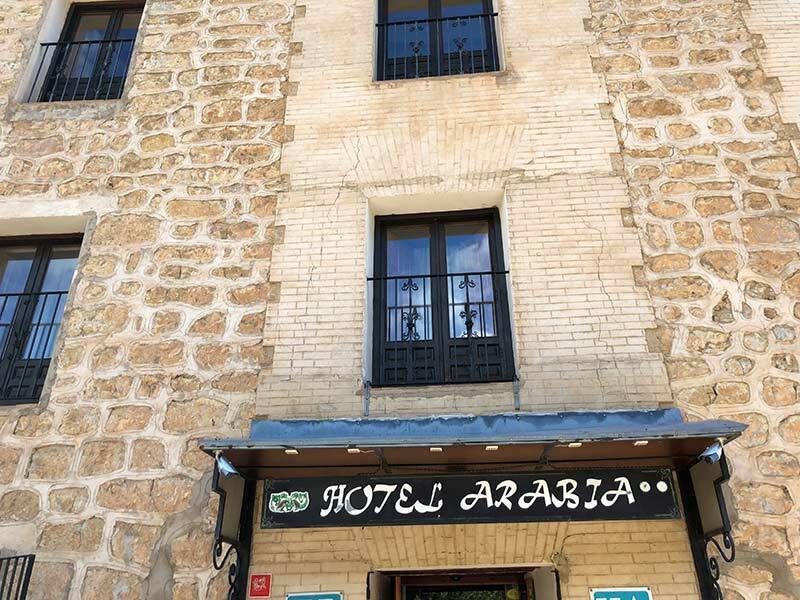 It is clean, neat, convenient (though there is a steep climb to Plaza Mayor) with private facilities, and great staff, yet still retains the feel of an old convent. There is free public parking right next to the Arabia Hotel. Latest prices and reviews here. Be aware of siesta time which can be from 2-3pm, and then things open again about 8pm. We were there on a Sunday and Monday, possibly the hardest days to find a restaurant or café open. As they were celebrating Corpus Christi, there was not a problem at lunch time, but dinner was slim pickings. Ditto Monday. 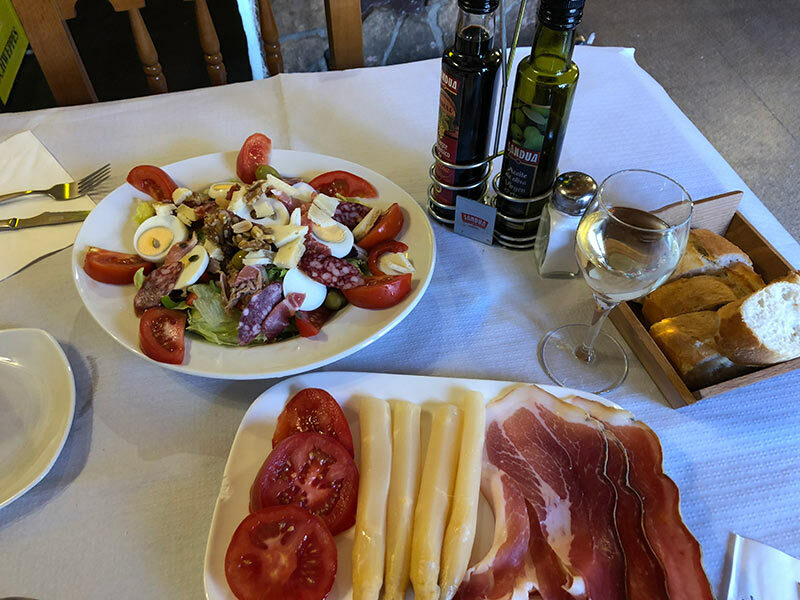 We did have lunch at La Taberna in the Plaza Mayor, and it was one of the best ensaladas/salad we had in Spain, as well as amazing service. We were recommended to try the following restaurants, and would have, if we had been there on different days. Albarracin, Spain is one of those unique opportunities to step back in time and to discover what it must have been like to live in a fortified city. While the population is dwindling, tourism is helping. 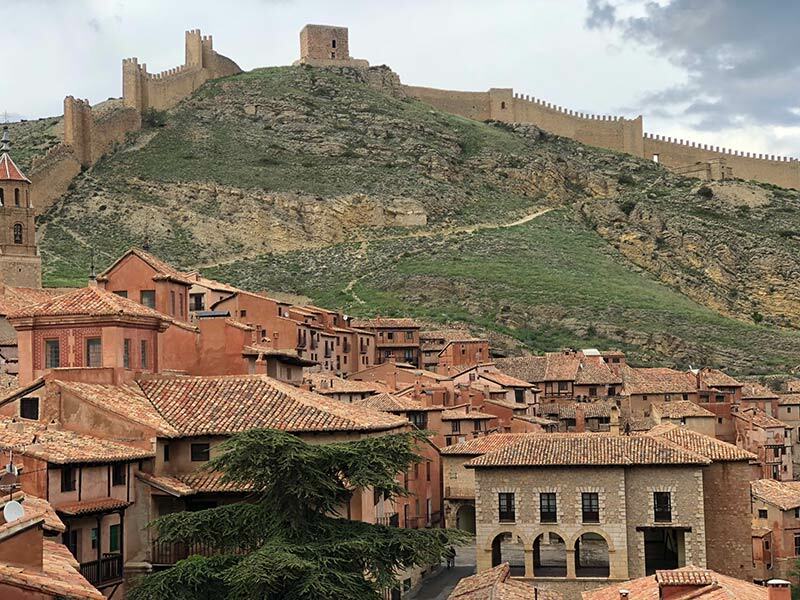 Many people make the day trip from Teruel and Valencia, but others, like us, choose to stay and to explore one of the prettiest towns in Spain. I think the photographs attest to that. it is amazing. Make sure to go. Love this blog and I love following! Found you on Twitter! Thank you Louisa, much appreciated.